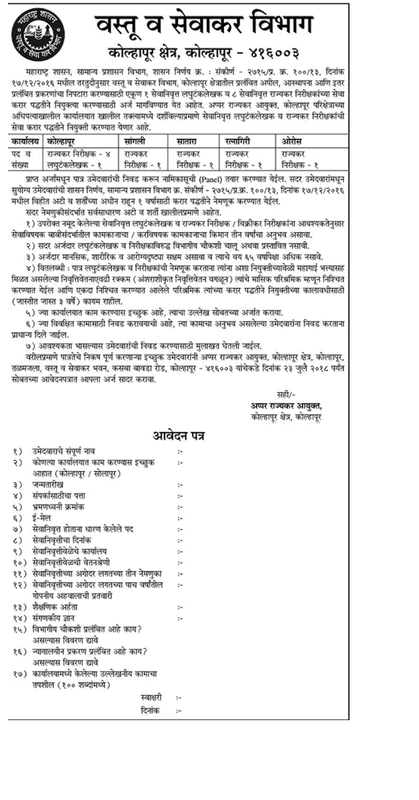 MAHA GST Kolhapur (Department of Goods and Services Tax, Maharashtra), Kolhapur Published Job Notification for 09 State Tax Inspector & Short Hand Typist Posts. Candidates who wish to apply must look at MAHA GST Kolhapur State Tax Inspector & Short Hand Typist Recruitment 2018. Eligible candidates can apply Offline before 23-07-2018. Interested & Eligible candidates can send their application along with all the necessary documents and testimonials to Additional Excise Commissioner, Kolhapur area, Kolhapur, Ground Floor, Goods and service tax Building , Kasba bavada Road Kolhapur 416003. Starting Date, Last Date to Apply Offline at Department of Goods and Services Tax, Maharashtra which candidates should be remembers as follows. Last Date to Apply Offline: 23-07-2018.